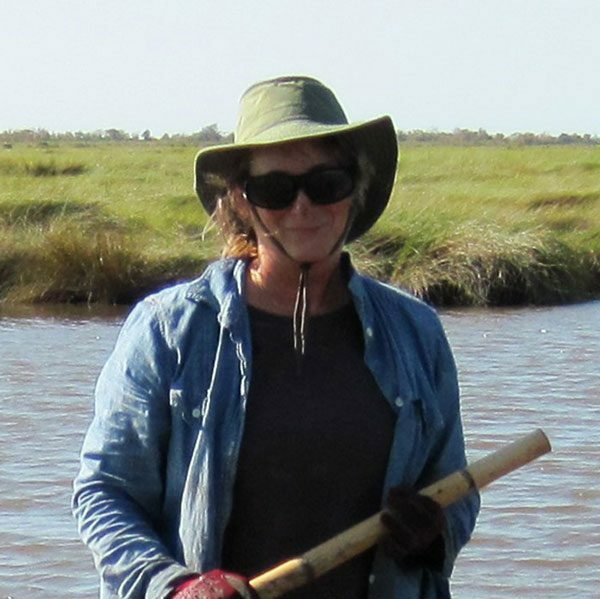 Karen joined Audubon in 2009 and brought nearly three decades of experience and research in coastal Louisiana to the team. Karen provides science support involving coastal processes, ecology and biogeomorphology (how living things affect land change) including expertise with coastal vegetation, oil spill impacts, hurricane impacts, and coastal habitat restoration. Karen became involved with the Louisiana Master Naturalist Program at the roll-out meeting in Baton Rouge in 2012, was a member of the LMN Greater New Orleans charter class in 2012, and is a charter member on the board of the LMN Great Baton Rouge chapter. At Audubon Louisiana, she works closely with the Paul J. Rainey Wildlife Sanctuary manager, Timmy Vincent, and the Director of Bird Conservation, Erik Johnson. She manages the small dredge operation at the Paul J. Rainey Wildlife Sanctuary in southwest Louisiana restoring marsh and has successfully applied for Coastal Use Permits; she conducts or assists on a variety of bird research projects including the Green Heron project featured in the recent Audubon Magazine, coastal bird surveys and monitoring bird use in newly created restoration areas; with Lindsay Nakashima she monitors the refill rate of dredge borrow areas with a GPS-linked fathometer system; with a small drone she monitors the vegetative response to dredge fill or to marsh burns at Rainey. Photography is integral to her work and play, and generally focuses on people or animals in their environment. A process person at heart, her research focuses on the interaction of wind, water, dirt and life. Moertle, Westphal, Duet, and others. (2014). A Louisiana Marsh Manager’s Permitting Handbook. Morgan, K.L.M. and K.A. Westphal. (2016). Baseline coastal oblique aerial photographs collected from Calcasieu Lake, Louisiana, to Brownsville, Texas. U.S. Geological Survey Data Series 988. Morgan, K.L.M. and K.A. Westphal. (2016). Post-Hurricanne Isaac coastal oblique aerial photographs collected along the Alabama, Mississippi, annd Louisiana barrier islands. U.S. Geological Survey Data Series 988. Morgan, K.L.M. and K.A. Westphal. (2014). Baseline coastal oblique aerial photographs collected from Breton Sound, Louisianan, to the Alabama-Florida border. U.S. Geological Survey Data Series 857. Morgan, K.L.M. and K.A. Westphal. (2014). Baseline coastal oblique aerial photographs collected from Dauphin Island, Alabama, to Breton Sound, Louisiana. U.S. Geological Survey Data Series 860. Kemp, G.P., K.A. Westphal, J.T. Tripp, and O. Fayanju. (Draft 2011). Central Role of the Mississippi River and Delta in Restoration of the Northern Gulf of Mexico. Westphal, K.A. (2010). The Christening of Audubon’s Mini Dredge. Barred Owl. Westphal, K.A., and S. Penland. (2009). Louisiana barrier island comprehensive monitoring program (BICM) volume 1: Barrier shoreline post-storm assessment part 2: 2006/2007 Aerial survey photography. Pontchartrain Institute Reports and Studies. Westphal, K.A. (2009). Louisiana Barrier Island Comprehensive Monitoring Program (BICM) Volume 1: Barrier Shoreline Post-Storm Assessment Part 1: 2005 Post Hurricanes Katrina and Rita Photography. Pontchartrain Institute Reports and Studies. Westphal, K.A. (2009). Louisiana Barrier Island Comprehensive Monitoring Program (BICM) Volume 1: Barrier Shoreline Post-Storm Assessment Part 4: Historic Photo-Pairs/Time Series. Pontchartrain Institute Reports and Studies. Penland, S., P. Connor, F. Cretini, K.A. Westphal. (2003). CWPPRA Adaptive Management: Assessment of five barrier island restoration projects in Louisiana. Pontchartrain Institute Reports and Studies. Byrnes, M.R., R.A. McBride, S. Penland, M.W. Hiland, and K.A. Westphal. (1991). Historical changes in shoreline position along the Mississippi Sound barrier islands. Coastal Depositional Systems in the Gulf of Mexico: Quaternary Framework and Environmental Issues. Draut, A.E., G.C. Kineke, O.K. Huh, J.M. Grymes III, K.A. Westphal, and C.C. Moeller. (2004). Coastal mudflat accretion under energetic conditions, Louisiana chenier-plain coast, USA. Marine Geology.